Child's Play - 21 month old "Ditto"
Put the twos where the two go. 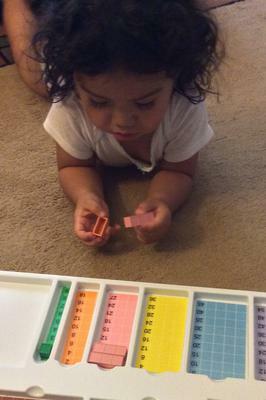 I emptied the tray and Ditto began sorting the blocks piece by piece. Comments for Child's Play - 21 month old "Ditto"
I know from my experience toddlers are natural sorters . 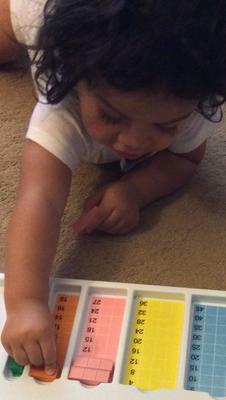 my little ones loved sorting their cars , their stuffed toys , ... how great to introduce the blocks at an early age and let them soak in the language of math . I shied away from it with my fist one and we struggled a bit with basic concepts , she is 9 now and doing really well in math but it was a hard start . her brother who was then a toddler not having any structured lessons just playing with manipulative next to us trying to keep him busy while i am doing math with his older sister . The results are amazing , he got it all effortlessly without any formal lessons and the best thing he doesn't ask me to learn math , in his words : mama can we play math now :) I said it on face book and I will say it here again , I think the blocks should be on every child first year birthday gift list , even i would personally buy one while I am pregnant before baby is sue , you never know when baby is ready and a teaching moment comes up . I will try with my 2.5 yrs old. she already loves to make 10 now. I will try this tomorrow.Thank you sharing it. Math to Babies...Are you serious? Gotta Love It! So wish I would have found this 4 years ago. But, glad you guys did. These make me smile. You win a prize for being the fist to submit something. Not sure what the prize will be but it will be something cool...like maybe a Pair or Ray-Bans (gold frame pink lenses)...or maybe more blocks or a teeshirt or something...thanks for sharing!